Lying in central England in Warwickshire and stretching from Coventry in the west and to the county borders of Northamptonshire and Leicestershire in the east, the borough of Rugby covers the town of Rugby and 41 parishes with a total population of approximately 100,000 and covering an area of 88,000 acres. 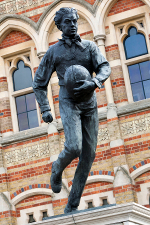 Known as the birthplace of Rugby football, Rugby has also been home to the celebrated war poet Rupert Brooke, Matthew Arnold and Lewis Carroll. It is also the birthplace of the hologram and Frank Whittle’s jet engine. The Council endeavours to make as many business opportunities as possible available online in an effort to meet its procurement policies. Many Council contracts are tendered via the CSW-JETS website in an effort to raise awareness of contracts and streamline and simplify the tender process. The system is fully secure and auditable, also further reducing the costs and risks associated with hard-copy tenders. Rugby Borough Council is committed to meeting the eGovernment agenda. That is to develop eProcurement solutions which include, amongst others, electronic: sourcing, ordering, tendering, reverse auctions and payment. Suppliers will be required to work with Rugby Borough Council toward its eProcurement objectives. It is strongly advised that businesses review the information above and at the following links prior to bidding for council contracts. This will assist in gaining a greater understanding of how the Council operates, enabling businesses to prepare their bids for council business.